Grand Theft Economics: Why no traffic jams in Los Santos. 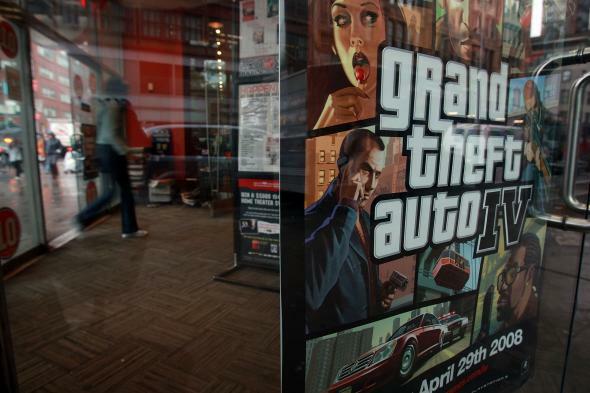 Driving around the fictional city of Los Santos depicted in Grand Theft Auto V over the weekend, I was struck by the fact that Rockstar Games’ painstakingly created pseudo-LA is missing one crucial element: traffic jams. There are cars on the road, sure, and if you bother to stop at red lights (sucker), you’ll sometimes be slowed down as you head from mission to mission. But an old-school pileup on the freeway? Doesn’t happen. Perhaps the game had decided to please technocrats everywhere by building an implicit congestion pricing model into the software? After all, a computer simulation eliminates all the pesky technical and privacy impediments to congestion pricing. The game always “knows” where you are and can seamlessly deduct micropayments. But the game has no such feature. I also thought it was possible that crusading liberals in the San Andreas state Legislature had just hiked gasoline prices through the roof. But when I pulled up to a gas station, the sign was touting amazingly cheap fuel: Just $1.69 a gallon for the basic gasoline. Admittedly, there was a curiously large upcharge for the fancier blend, but $3.69 for the high-octane stuff is still cheap. What’s more, if you actually drive a car (or seven) around, you’ll notice that GTA vehicles never seem to need refueling. The answer, obviously, is that the lack of traffic jams is intimately connected to the ease with which you as a player can procure a car. In the real world, carjackings are fairly rare. Someone who just regularly stopped cars in broad daylight in random neighborhoods and stole cars would find himself getting caught rather quickly. Police departments tend to take these things rather seriously. The Los Santos Police Department takes a very different view. Yes, if you steal a car officerwhile directly in the line of sight of a LSPD, you’ll probably earn yourself a star. But it’s not that hard to evade a one-star rap, and the vast majority of the time you can steal a car with no consequences whatsoever. Nobody investigates these things or even cares. Heck, you can even use the car you just stole to run over the previous owner and nobody will mind. The obvious upshot of this is going to be a radically lower level of per capita car ownership than we observe in the real world, concurrent with much cheaper gasoline. In a world where most households simply don’t want to invest in car ownership because their vehicle is far too likely to be stolen, there’s just not going to be very much traffic congestion. And you can see that Los Santos is a bit more of a “complete streets” kind of place than the real Los Angeles, with good sidewalks just about everywhere. Like the real LA, they’ve made some under-heralded investments in rail transportation, and driving around, you also see tons of buses. Without vigorous law enforcement attention to the problem of car theft, the bus is the far more practical option.